Country-style, peaceful, spacious bedroom with queen bed, sofa-bed, lounge chair, antique desk, and private bath. Includes use of the Great Room and private use of the Jacuzzi Room. Donation rate for Ordained ministers: $125 per night; $75 per night if coming for a Revitalization, Refocus, or Renewal Retreat (2 night minimum). The Jacuzzi Room is reserved for those staying in the Vineyard Suite. This room is complete with a 2-person “Spaberry” Jacuzzi, and is also a place to sit, chat, drink coffee, read a book, etc. Upstairs bedroom with a very comfortable Queen bed, private bath, Wi-Fi, antique small desk, TV with DVD player, CD player, and amazing views of the Wildlife Pond and our woods. Donation rate for Ordained ministers: $100 per night; $75 per night if coming for a Revitalization, Refocus, or Renewal Retreat (2 night minimum). Includes full breakfast. Upstairs bedroom with Queen bed, comfortable futon, Wi-Fi, antique desk, TV with DVD player, CD player, natural view of our Wildlife Pond, and private bath (new as of February 2017). Sleeps 3. We ask our guests to please make half (or all) of the requested donation prior to their stay. This will reserve the room and allow us to begin planning your retreat. You may send us a check, use our “CONTRIBUTE“ page, or call us with your credit card information. Please let us know if you need a scholarship to assist with your donation. Cancellation policy: If you need to cancel within one week of your stay, we ask that you would please contribute 50% of the requested donation to BMI. 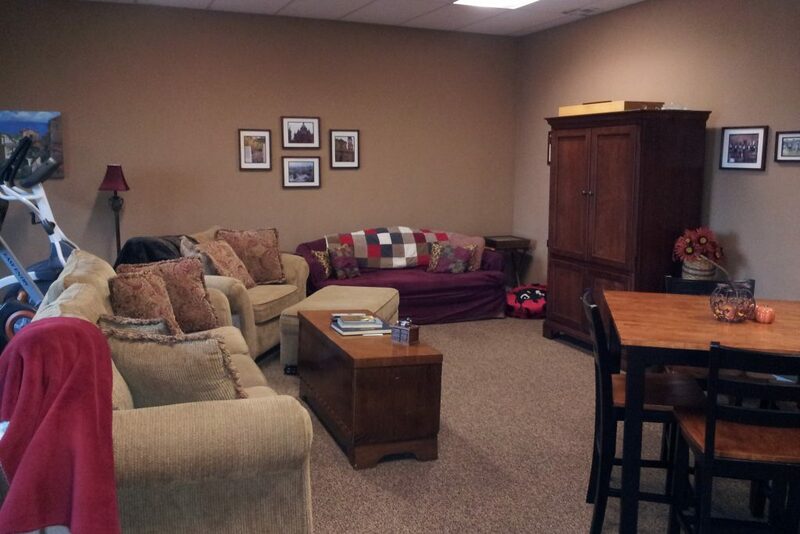 The Great Room is available for anyone staying at the Oasis. It is a very relaxing setting for prayer and study, watching a movie, preparing and enjoying a meal, spending time with spouse or family, playing games, or even for a workout on the elliptic or stationary bike. 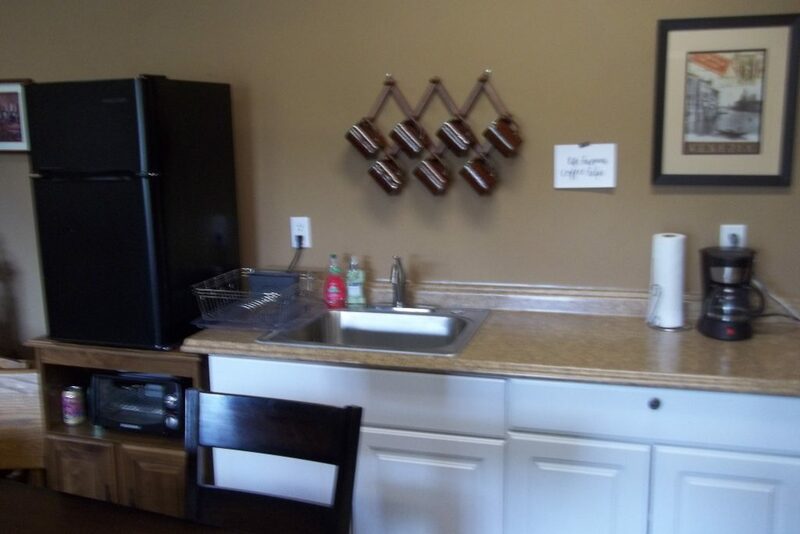 Includes kitchenette, TV, dozens of family and child friendly DVDs, Wi-fi, Ping-pong, board games, plush sofas, a workout area, and toys for children. Also serves as a meeting room for up to 15 people. Just outside the Great Room is a patio with grill and outdoor dining area. UP North Sandwich and Pasty Co. The lake was an area favorite for steamboat rides in the 1880s, and in the early 1900s, Labelle Park brought a luxury hotel, toboggan slide, and miniature golf to the region. Today, Gull Lake’s shoreline is lined with multi-million dollar summer homes and remains one of the most sought after addresses in the state. Year-round outdoor activities such as boating, golfing, hunting, fishing, skiing, ice fishing, and ice boating makes Gull Lake a unique place to call home and visit. Midway between Detroit and Chicago is a museum like no other. It’s the Gilmore Car Museum, a collection of over 300 extraordinary vehicles on a 90-acre historic campus. A campus that also features partner museums including the Classic Car Club of America Museum, the Pierce-Arrow Museum, Franklin Collection, Cadillac-LaSalle Club Museum, Model A Ford Museum and the Lincoln Motorcar Museum. Come to experience more than 20 exhibit galleries and amazing historic buildings. Enjoy the vintage car dealerships, the 1930s gas station, the authentic 1940s Blue Moon diner, and more. There’s nothing else like the Air Zoo. Their unique combination of attractions, activities, and adventure are sure to make man’s first century of flight come to life in a special way for you and every member of your family or group. Located near Gull Lake, the bird sanctuary is open Summer 9 a.m. – 8 p.m., and Winter 9 a.m. – 5 p.m. Ducks, geese, swans, and birds of prey are permanent residents. Enjoy theatre at its best with plays, musicals, and Broadway actors! The Barn Theatre is perfect place to spend an evening after your day on the golf course. Visit their website for a complete list of summer shows. Advanced reservations are recommended. Shows play Tuesday – Sunday. Binder Park Zoo is involved in a variety of conservation programs to help preserve species like ring-tailed lemurs, white handed gibbons, Mexican wolves, red pandas, and others. Visitors of all ages enjoy the natural forest environment and diverse native wildlife found in the park. Fall Activities include Apple orchard, corn maze, and pumpkin patch! Home to great kids activities, donuts, hayrides, cider and more! Boat rentals on beautiful Gull Lake, wave runners, pontoon boats, and Sea Doo jet boats.